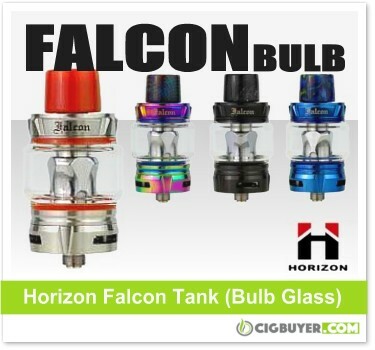 Horizon Falcon Tank – ONLY $19.99! Our top pick for best sub-ohm tank of 2018, there’s a new “bulb glass” version of the Horizon Falcon Tank… and US vendor Volcano Cigs has an unbeatable price of only $19.99! It’s exactly the same as the standard 25.2mm (5ml) version, but it includes an enlarged 7ml bulb glass tank. Incorporating HorizonTech’s unique and ultra-flavorful Falcon Coil Technology, it comes with a 0.20 ohm F1 Coil (30% wood pulp with 70% cotton) and a 0.15 ohm M1 Mesh Coil (mesh w/ wood pulp and cotton). The Falcon Tank is top-filled, includes triple bottom adjustable airflow and comes with a 8mm bore sloped resin drip tip.